At the start of March I decided to change a few things in my life, regarding health and fitness. I dusted of my running shoes and went for a 1.5 mile run, which left me a mess! You can read all about it here and here. After the struggle of the first few runs, where I stopped every few minutes to 'catch my breath' I started to focus and push myself a little further on each run. After a total of 15 runs mainly on the road (some on the treadmill) and about 1.5 miles each, I can now run (jog is more realistic) over one mile without stopping to 'catch my breath'. 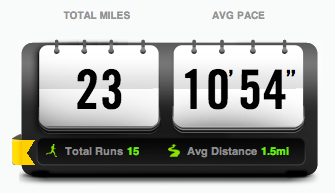 That is a massive improvement for me and I think I have caught the running bug. In addition to start running in March, I also took the leap and joined the gym!!! I have fully lost my mind. I have been attending two exercise classes a week and working with a Personal Trainer, to put a program together that I can stick to and achieve my goals. 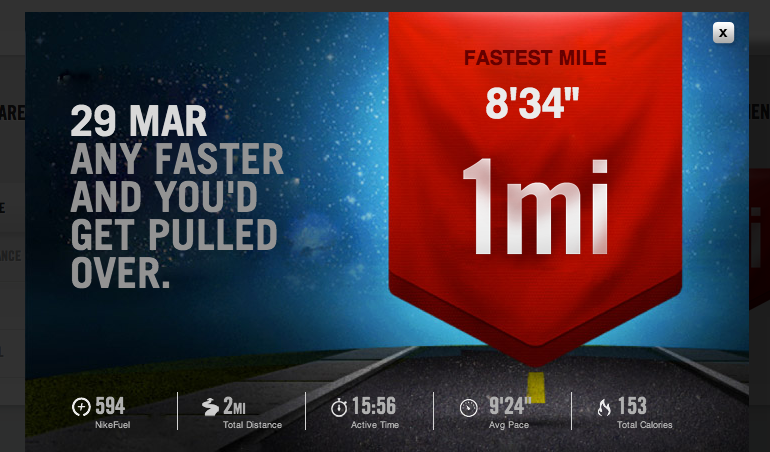 To track my miles, time and calories burnt, I have been using the 'Nike +' app on my phone. It has been really useful to see the stats build up on my phone, but even more on the 'Nike +' website. The below images are taken from the website. The shocker of them all, I ran my fastest mile! I first ran my fastest mile on the treadmill, which I then set my mind to achieving on the road. The first image can be found on Pinterest, the other images are my own. Love your style! I'm following you!